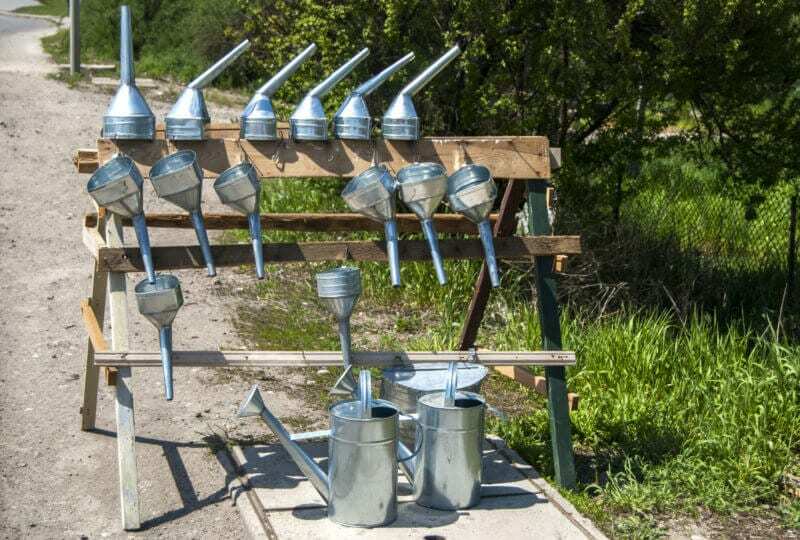 Funnels are all the rage these days. Everyone and their brother are ready and waiting to sell you a funnel. Obviously, I’m kidding, but lately, it does feel that way. Each time I log into Facebook, there are no less than five ads from gurus ready to sell me a funnel. 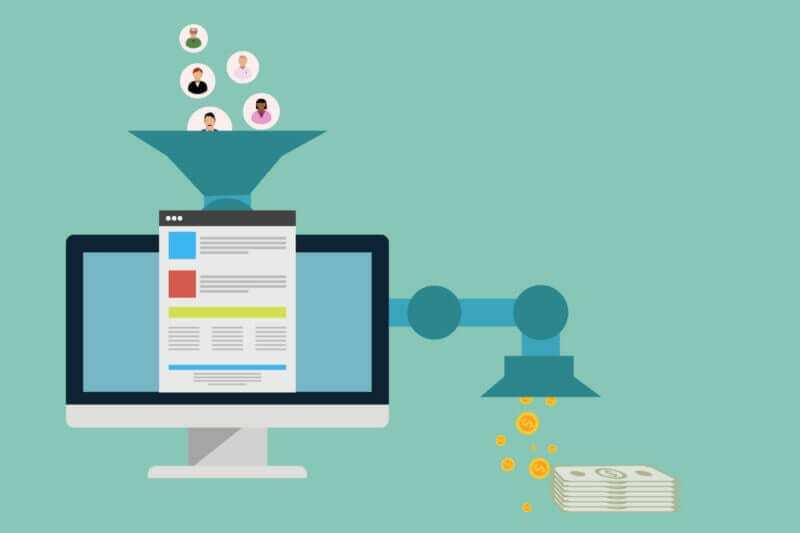 Building a “funnel” means so much more than receiving a lead from an infographic and emailing them every other day for the rest of eternity. All leveraged forms of engagement should contribute to the same funnel, from the time your brand is introduced all the way through the sale. Businesses with long sales cycles typically include more touch points than their counterparts with short sales cycles, but the thing is, building the funnel is only half the battle. I’ve worked with several businesses that had funnels or had an idea for the direction that they wanted to take their funnel but struggled with an important part of the process: measuring the funnel. How to know when “awareness” tactics are actually doing anything (read: making people aware). Knowing where to allocate budget efficiently and effectively throughout the funnel. Ensuring all of your channels are contributing to the same funnel path and goals. Ensuring lead volume is translating into sales. How to understand which channels and tactics are driving new leads, which channels and tactics are closing leads, which channels and tactics are nurturing leads and which channels and tactics are supporting cross-sell and renewal, so you can allocate budgets and plan. Ultimately, the purpose of creating a funnel is to drive sales. In order to convince a prospect to purchase, you have to meet their needs. Instead of thinking about the ideal path that we’d like the prospect to take, we think about the ideal path that the prospect would like to take. We then ask what information they need and how they want to receive that information. Depending on the business type and the length of the buyer’s journey, the funnel length can vary greatly, and touch points and goals each business employs will naturally differ. Typically, a long buying journey means multiple channels are leveraged in order to engage and re-engage prospects. This make it even more important that there is one unified funnel with metrics defined. The most effective goals are Specific, Measurable, Attainable, Relevant and Timely — or, as I’ll refer to them here, SMART. I’ve provided some examples of general, measurable themes below. You’ll notice they aren’t SMART as is. In order to make these goals SMART, each advertiser should customize the goals to ensure they are also attainable, relevant, timely and specific, according to their needs. In order to confidently invest in high-funnel channels, it’s critical to be able to tie performance back to goals. High-funnel tactics tend to get a bad rap because “awareness” can be difficult to measure. Still, each channel and tactic should be accountable to a goal, both for the sake of justifying the time and money and also to give the channel a chance to prove itself. To increase awareness of a solution to a certain problem (but not necessarily creating brand awareness). To drive awareness of a certain event or promotion. To create awareness of a new product or product line. To test messaging to new audiences in order to determine which is most engaging. The next step was to make them SMART goals, and part of that was determining how we would measure each. Some metrics can be helpful in measuring top-funnel effectiveness, including high-funnel lead generation, such as leads from top-funnel content; clicks; click-through-rate; the number of pages viewed or which specific pages were viewed; time on site; social engagement; impact on branded search volume; impact on building audiences. Depending upon your sales cycle, tactics and level of attribution sophistication, you may even be able to measure the long-term impact on sales from the top of the funnel. Although impressions are a performance metric, I cringe when they are the primary goal. I consider impressions to be a secondary metric, or sometimes even a health goal. It’s a concern if impressions plummet for no reason — but not for the sake of impressions — for the sake of missing out on opportunities to achieve a more important goal. Here are some examples of the ways the metrics mentioned above were used to measure progress toward goals. They are just examples, and this is no way a comprehensive list; many of these goals could be measured in several different ways. Measure an increase in brand awareness by measuring the delta in branded search volume. Measure an increasing awareness of a solution to a certain problem by measuring an increase in nurture program entrants for that problem. Measure an increase in awareness of a certain event or promotion by measuring usage of a promo code and/or search volume. Measure awareness of a new product or product line by measuring the increase in visits and time on site for informational pages about those products. Measure the engagement of messaging to new audiences (click-through rate, conversion rate, or even conversion per impression, depending upon the test) to determine which was most engaging. Mid-funnel leads are those that have an interest in the brand and solutions but haven’t decided yet. For B2B companies, these are leads that have shown interest but are not yet marketing qualified leads (MQLs). Prospects in the middle of the funnel are aware of the problem at hand and are actively seeking out solution options. Increasing interest in products or services as solutions to a certain problem. The middle of the funnel can be measured by mid-funnel lead generation, such as people that engage with mid-funnel content, existing lead engagement with mid-funnel content, funnel progression and lead score increases. The middle of the funnel is most easily measured with technology, such as a customer relationship management (CRM) or marketing automation platform. It can also be measured creatively with audiences and micro-conversions. 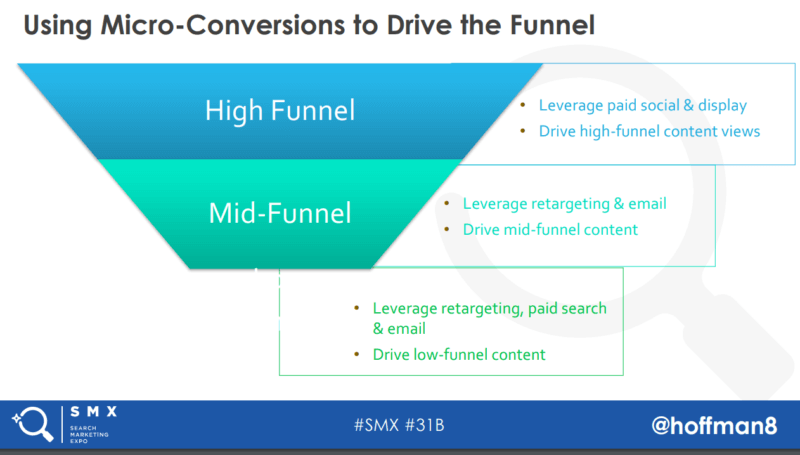 Applying high-funnel audiences as observation (or even targeting) to mid-funnel campaigns can add visibility into mid-funnel tactics. Measuring the interest in products or services as solutions to a certain problem through requests to receive content about those products or through inquiries for more information about products. Measuring the warmth of high-funnel leads through lead score increases, lead stage progression or the tendency of audiences created through high-funnel tactics to engage in mid-funnel conversion actions. Low-funnel metrics are arguably some of the easiest to track, as these tend to correspond with the primary goal of the marketing strategy: sales. Increasing hot leads by X number or X percent. Increasing sales volume by X number, X dollars or X percent. 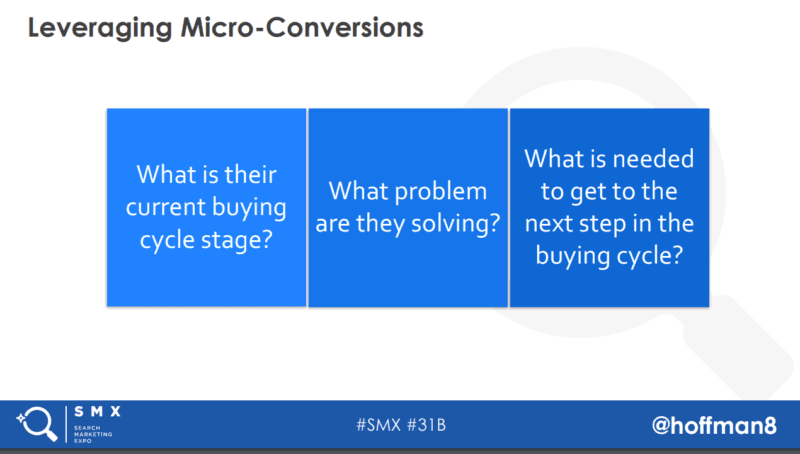 Improving the lead-to-sale conversion rate by X percent. Low-funnel metrics should be reflective of the action(s) you ultimately want your prospects to take. In many cases, advertisers track phone calls, demo requests and online sales in order to benchmark low-funnel performance. In-store visits, lead-to-sale conversion rate, sales volume and sales revenue are great data points to capture as well. Your funnel doesn’t have to end with the sale. In fact, I hope it doesn’t! There’s still a lot of data goodness to be mined in order to shape your marketing strategy. Increasing the lifetime value of customers. Measuring an increase in the lifetime value of customers by improving customer retention. Measuring an increase in the lifetime value of customers by increasing cross-sell and upsell revenue. Measuring an increase in the lifetime value of customers by working toward x percent of product penetration for a new product (or an under-sold product). Measuring customer satisfaction increases through net promoter score, client referrals and entrants to the client advocacy and/or customer loyalty program. Lead velocity. How quickly are leads traveling through each part of the funnel? Average deal size. Is there room to improve this metric? Are some channels driving larger deal sizes? Is there a channel mix that’s driving larger deal sizes? Industry benchmarks, where available. How does your performance stack up against your competitors? Total addressable market (TAM), serviceable available market (SAM) and serviceable obtainable market (SOM). How much of the market share are you targeting, how much can you realistically capture, and how much are you currently capturing? Return on advertising spend (ROAS) and return on investment (ROI). How is your marketing investment paying off? Attribution plays a key role in understanding cross-channel impact as well. Align the funnel with the buyer’s journey, taking into account the information the buyer needs in order to progress to the next stage. Create goals for each stage of the funnel and determine how they will be measured. Ensure all funnel stages, goals and metrics are working in harmony to effectively measure funnel engagement and health. The post Are you holding your funnel accountable? appeared first on Marketing Land.